K A C E Y C H O : IS HAVING BRACES PAINFUL?!! Just a quick update on my braces treatment. Picture below was the second day after putting on braces. I am only having braces for my upper set of teeth. Honestly if you ask me i wouldn't want to take away my baby canine. Unfortunately i am not born 50-100 years later where technology will be so great that we don't have to have braces to make our teeth straight anymore. Too bad i am born in this era haha.. (Not sure if there will be such a technology but i am sure scientists are experimenting it already. 10 years ago we don't have invasalign but now we have. Maybe 100 years later we can have our teeth straighten in a day. Sorry for the sudden side track. Back to topic!) ...Have to go for braces if you want an affordable and straight set of teeth. DO YOU FEEL PAIN AFTER HAVING BRACES? No leh. I felt fine and i felt nothing major. I don't feel pain when i talk too. I was already prepared for the pain to kick in an hour later after braces. I heard and saw a lot of comments that they felt damn pain & they couldn't sleep and what not. I guess i am lucky! hahaha. I only feel like i have something in my teeth that is all. If you don't touch your teeth, YOU WON'T FEEL PAIN. For the first three days i wasn't able to chew. I literally had to give up biting and consume just porridge. THE ONLY PAINFUL PART WAS TO HAVE ANYTHING IN CONTACT TO YOUR TEETH. So to avoid that, just 'drink' porridge. Your teeth will be very sensitive for the first few days after braces. BUT YOU WILL ONLY FEEL SENSITIVE WHEN SOMETHING TOUCH YOUR TEETH. E.g. if you drink water and the cup accidentally knocked slightly to your teeth, OUCH that can hurt. Or you try biting even the softest food, OUCH that can hurt too. So just don't touch your teeth la. Just eat porridge and won't feel pain. hahaha. Today is the 9th day of braces and i can bite and eat already. I really shouldn't scare myself by reading so much braces experience from others. 自己吓自己. DID YOU HAVE A LOT OF ULCERS??? Again, nope! 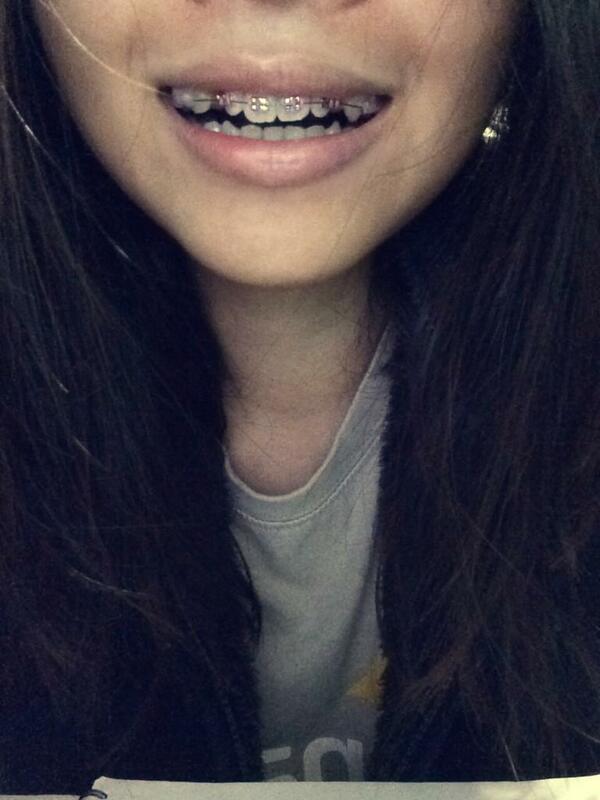 I think i am really lucky because i asked my friends who did braces before and all of them said they have ulcers! Also i read all the braces experience from online and 90% of them said they had ulcers. They had tons of ulcers, super ultra big ulcers and ... just ulcers la. I was very afraid of getting ulcers. Who doesn't? But i also had a mental preparation of getting a few. And then that first night, i was waiting for my ulcers. Didn't come and i waited another day.. And another day until i sort of confirm that i won't have ulcers, I THINK. haha. But i am taking precautions everyday. I make sure i don't move my lip a lot and keep very good oral hygiene. Yup i guess those are the only 2 popular questions people like to know. OH i tried eating BA GUA and i can eat! LOL. Wait i shouldn't be too happy first because this is just my first treatment. Maybe i will feel pain and have ulcers and feel damn horrible when i go for next treatment. But i pray not. Hope my teeth can move as fast as possible too. Felt like months of putting on braces already and its only 9 days. Everyday i check if any of my tooth has moved. So far only the front ones are working. haha. Then i keep talking to my teeth and tell them to please move faster... Sigh ok i'm getting a bit nonsensical here already. I will stop here. goodnights!